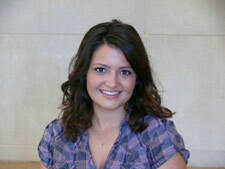 Jamie Sklena is a senior in the Department of Kinesiology and Community Health. What are your general impressions of your studies and the Department of Kinesiology and Community Health as a whole? I find it is easier to study and pay attention in class because the material is interesting, and applies to everyday living. The professors that I’ve had have been enthusiastic about teaching kinesiology, which makes class more interesting and helps the material stick with you. I find it difficult to isolate a single experience that has been the most interesting at the University of Illinois. However I can say that the most significant part of going to school here has been that it has led me to realize what I really enjoy, and what I want to do with my life. I'm not sure if it was the eye-opening cadaver labs, the in-depth science classes, or the interactive physiology labs, but the path I took with kinesiology gave me a passion for medicine and science. To me this is significant because I'm an awfully indecisive person, and to find something I'm sure about is a fantastic thing. What extracurricular activities/student organizations are you involved with? I play intramural sports, tutor chemistry, and am a member of the Kappa Kappa Gamma Sorority. I enjoy running, going out with friends, and watching every Bears/Cubs/Blackhawks/Illini game possible! Why would you recommend the Department of Kinesiology and Community Health to others? I think the KCH program is great because it gives students a unique background that is applicable to a wide variety of careers. The College of Applied Health Sciences teaches concepts that allow students to approach realistic situations from a different angle, which is a valuable attribute to have for future careers.